My second favorite biscuit was a little different. Think of it this way. The Green-Eyed Monster was like a fiery redhead, exuberantly gathering all of the attention in the room. 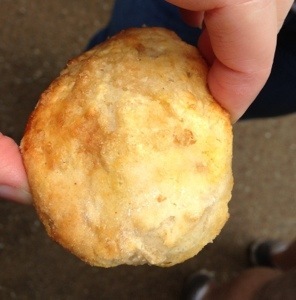 The Country Apple Cinnamon Biscuit was like her quiet, intellectual sidekick. No less interesting, but easier to miss. See? It was a little flat and plain. I almost passed it by and my expectations were low. Trust me though. It was wonderful. Light and fluffy, slightly sweet, with just enough cinnamon and a hint of apple. Such a pleasant surprise. This one was made by Latitude 35, a restaurant right on Market Square. Third place, in my opinion, was somewhere between these two characters, if we’re going to continue my metaphor. Perhaps not the life of the party but everyone’s best friend. Oh my word. 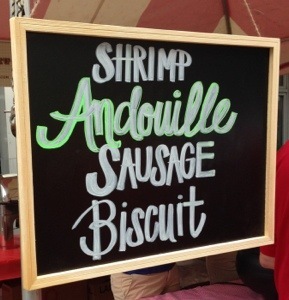 Shrimp Andouille Sausage Biscuit. The biscuit was fine but that gravy was amazing. I’ve never really tried to make gravy before but this both inspired and intimidated me in almost equal parts. If you happen to have a killer gravy recipe, please share it with me! This one was made by Applewood Farmhouse Restaurant. That’s it for now. More later . . . 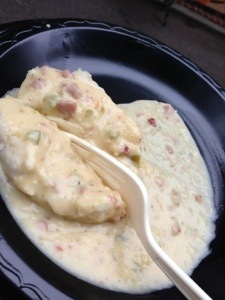 This entry was posted in Activities and tagged Andouille, biscuits, Biscuits and gravy, Festivals, Knoxville. Bookmark the permalink.